President Barack Obama saw his bid for reelection take a big step forward as wife Michelle Obama had a star turn at the Democratic National Convention on Tuesday with a rousing speech. Looking warm and graceful in a custom Tracy Reese dress and J.Crew pumps, Mrs. Obama spoke from the heart about her husband’s ability to maintain his ideals as a man and as a father, even with the demands of his position. Anderson Cooper: “Never heard such a well delivered speech by a first lady ever." 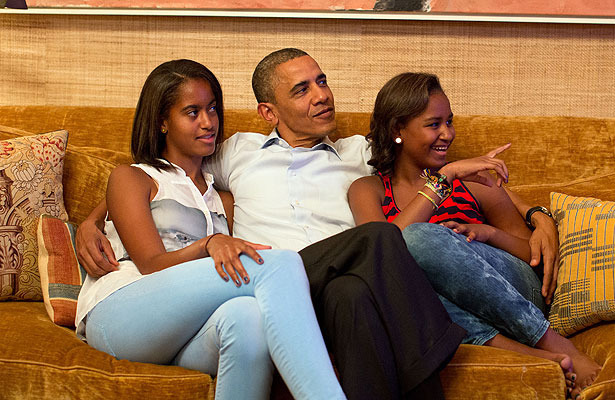 President Obama enjoyed his wife’s presentation, watching it from Washington D.C. with daughters Malia, 14, and Sasha, 11, tweeting the below pic. President Obama is scheduled to arrive to the convention on Thursday.